“Music constantly inspires me. It makes me smile, dream, think and breathe. I hope that this CD does the same for you and touches you from within.” Eira Lynn Jones. ...from within includes perfomances on both pedal and clarsach harp in a variety of musical styles - classical, contemporary, folk and a jazzy piece! I AM CONTINUALLY ASKED whether I have made a solo CD and, finally, here it is! We recorded this in a beautiful church overlooking Melior, near Stockport, so that we could capture the live sound that is heard in my concerts. These are pieces that I have enjoyed teaching and playing over the years, many written by harpists. It was a joy to play my Salvi Arianna pedal harp alongside my Starfish Glencoe Clarsach. Music constantly inspires me. It makes me smile, dream, think and breathe. I hope that this CD does the same for you and touches you 'from within'. This set of 6 short pieces by the French composer and harpist, Bernard Andres, is popular with all my pupils, who always inspire me with their hard work and dedication. A little gem of a piece by the harpist and teacher, Marcel Grandjany, which I dedicate to my own inspirational teacher, Kathleen Bride. A translation of the poem Clair de Lune by Paul Verlaine. This much loved piece from Debussy's Suite Bergamasque for piano is one of my all time favourites. I include it as a thank you to my family: Hywel and Enid Jones; Linda, Glyn and Teleri; and my three nephews, Daniel Calan, lestyn Gwyn and Morus Caradog. Eddie MCGuire's Prelude for clarsach was commissioned by Alison Kinnaird in 1998, and premiered by Judith Peacock. It is one of 22 Preludes for different instruments, written over a 30-year period. John Rutter's Dancing Day for harp and choir includes this haunting solo. Composed for Honor Wright in 1972 by Roger Nichols, this Impromptu deserves to be more widely heard. I love teaching Fiona Clifton-Welker's music; this is a fun piece, included in the Trinity non-pedal harp syllabus. Translated as 'Sad am I', this is a traditional Scottish lament arranged by Ann Macdearmid. 'A harp without a tuning key, a church without an Abbot' was written by Mary Ann Kennedy, my first student at the RNCM. A simple air by the blind Irish harper, Turlough O'Carolan. My beloved god-mother, Adela Barnard, died in February 2006. She would have been so proud to hear this CD. This rousing pipe march was written for the Scottish Power Pipes Band by Phil Cunningham. It is a pleasure to conclude the album with this arrangement by Catriona McKay, a student of mine for many years, and who is now a great friend and colleague. 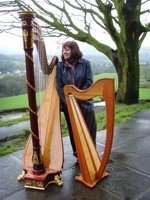 WELSH HARPIST ERA LYNN JONES, combines a busy performing schedule with teaching at the RNCM, Chetham's School of Music and privately. Her eclectic career embraces concerts with the Halls; recording with a heavy metal band; playing for the Welsh Rugby Union, as they celebrated their Grand Slam Victory at the House of Lords; appearing in two episodes of Coronation Street, watched by 16 million people ... and much more besides! A dedicated teacher, she is passionate about helping each pupil reach their full potential, wherever their strengths may lie. This album is dedicated to all her pupils, past and present. John Longstaff for his excellent producing and all the additional help and advice. John Hutchinson for such calm and patient engineering. Neil Johnson for the fabulous painting, and for believing this would happen some day. Kirsa Wilkenschildt for the lovely design. Louise Thomson, who accepted 'payback time' and read the poems. All the composers and arrangers for allowing me to record their music. Melior Parish Church and Centre for permission to record. To Steve, without whose constant love and support, none of this could have been done. MOONLIGHT is taken from 'One Hundred and One Poems' by Paul Verlaine translated by Norman R. Shapiro, published by the University of Chicago Press. ©1999 by the University of Chicago. 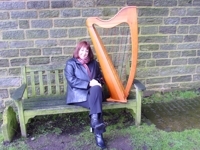 Welsh harpist, Eira Lynn Jones, combines performing with a teaching career based in Manchester. Studies at the Royal Northern College of Music and the Manhattan School of Music, New York brought her numerous awards, including the Guinness Foundation Scholarship, an ISM Young Performer Award and a Welsh Arts Council Scholarship. She was Principal Harpist with the Northern Ballet Theatre Orchestra for six years, touring extensively with them. As a freelance harpist, she now performs with the Hallé Orchestra and the BBC Philharmonic, amongst others, and has appeared in concerts at the Hollywood Bowl in LA, the London Proms, tours to Europe, USA and Japan and numerous orchestral recordings. She is a member of the Aeolian flute and harp duo, has recorded a CD of Music for Organ and Harp and has premièred several new works for harp. As a soloist, she is regularly heard on the Daily Service and recently accompanied Aled Jones on Songs of Praise. She was seen by 16 million people, appearing in two episodes of Coronation Street, when she played for the wedding of Steve and Karen MacDonald. 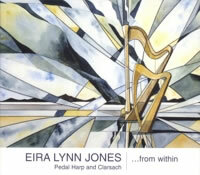 Eira is also a dedicated teacher, being Head of Harp Studies at both Chetham’s School of Music and the RNCM. She has developed two flourishing harp departments, and her enthusiasm has seen a renewed interest in harp playing around the North West region. Her playing has not only taken her all over the world, but it has led to invitations to perform in unusual settings. She has played on a heavy metal CD, flown to Spain for a private function for the Prince of Wales, and even played at the top of the Empire State Building. Highlights of 2007 include the release of her first solo CD "…from within", a recital and master class at the Edinburgh International Harp Festival, a 5 day teaching residency in Greece, appearing at the European Harp Symposium in Cardiff and directing 20 harps at the Huddersfield Contemporary Music Festival in November.